Amidst all the excitement of a new show in London UK going on sale this morning, has anyone noticed that Leonard is playing a concert tonight at the John Labatt Centre in London Ontario? I went to the previous show at the John Labatt Centre in May 2009. I hadn't intended to go to it but I was doing that obsessive thing of seeing what tickets were available when a seat right in the middle of the front row popped up. I couldn't help myself - I bought it and thought about the logistics afterwards. We were due to land (from London UK) in Toronto around 2.30 pm, intending to drive up to Ottawa the next day for the first of the two shows at the National Arts Centre. Instead, all we had to do was take a "slight" detour in the opposite direction for the show in London ON the same night. Oh was I glad we took that detour. The show at the John Labatt Centre, a small-ish hockey arena, was one of the best I have ever been to. I wasn't the only one who thought that. Ed Saunders thought it was pretty special too and he included a song from the show on the Songs from the Road compilation. If Ed's fond memories are shared by Leonard and the rest of the UHTC then tonight's audience are in for a(nother) special treat. The John Labatt Centre, which opened on October 11, 2002, was named after John Labatt, founder of the Labatt brewery in London. Labatt still has a large brewery in London to the present day, although its head office was moved to Toronto in the early 1990s. The John Labatt Centre's name was changed to Budweiser Gardens in Fall 2012, as approved by London City Council on Tuesday, June 26, 2012 with a vote of 12 to 3. The JLC was built, in part, to be the new downtown home of London's Ontario Hockey League team, the London Knights, replacing the 40-year-old London Ice House in the south end of the city, near Highway 401. Since 2011, it is home to London's National Basketball League of Canada team, the London Lightning. Alex Heats Up the Hallway 15 mins to showtime. Last edited by sturgess66 on Wed Dec 12, 2012 7:18 am, edited 1 time in total. 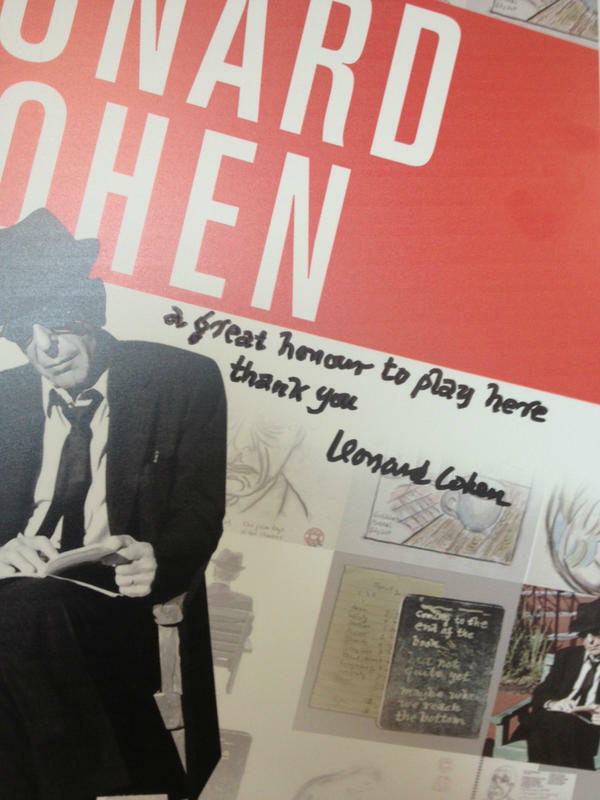 "Whoever said poets are the unacknowledged legislators of the universe should have had Leonard Cohen in mind." Maybe there was a corner of downtown London where a little bit of heaven prevailed on Tuesday night. Whatever future generations make of the events at city hall on Dec. 11, 2012, it should also be recorded that on the same night a Budweiser Gardens crowd of about 5,500 fans stood up as a 78-year-old Canadian poet jogged briskly to centre stage to begin a concert expected to run more than three hours. Whoever said poets are the unacknowledged legislators of the universe should have had Leonard Cohen in mind. When Cohen was done jogging Tuesday, it was time for a quick “thank you” and the man in the trademark fedora and suit to sing Dance Me To End of Love. It also was a chance for Cohen to acknowledge his visits may become a rare thing in the future. If that sounds like an admission mortality is on Cohen’s mind, there was many pointers in the opposite direction. Cohen moved around the stage, often getting down on one knee to sing. “Thank you for that very warm welcome you gave us when came on to the stage,” Cohen said early. If wasn’t just the audience, he saluted in the early going as The Future and Everybody Knows arrived in the first half hour. Violin ace Alexandru Bublitchi was the first band member to receive a nod. Then Cohen doffed his fedora as electric guitarist Mitch Watkins took a lovely, Robbie Robertson-esque solo on an arrangement of Bird on the Wire that seemed to pay homage to The Band. Hammond B3 player Neil Larsen was saluted, too. The singers — Sharon Robinson and Webb Sisters, Charlie and Hattie — were also named by the poet-singer-­songwriter superstar as he looked to their side of the stage. Acoustic, flamenco style guitarist Javier Mas had an extended solo to a hushed downtown London arena and won perhaps the ultimate Cohen accolade, a touch of the fedora. All this attention to the band wasn’t just verbal. The big video screens spent a lot of time showcasing the musicians around Cohen even when he was hitting those low baritone murmurs no one else can find. That’s democracy in action. Musical democracy anyway. QMI Agency critics have traced Cohen’s return to the top with one saying it began to build when Hallelujah finally won the attention it deserved. Cohen’s career was in a serious tailspin by the time he released his seventh album Various Positions in 1984. The first song on side two was a secular hymn called Hallelujah. It emerged from semi-­obscurity and now it’s the Cohen song many fans would vote for if they could hear him sing just one. I also became an anthem for such stars as Bono, John Cale, Justin Timberlake, Bon Jovi and fellow Canadian star k.d. lang, who sang it at the opening of the 2010 Olympics and includes it in every concert. Then, in 2004, news came to light that Cohen’s former lover and trusted business manager Kelley Lynch had pilfered $10 million of Cohen’s savings, leaving Cohen broke. As much as Cohen disliked touring, he had to replenish his retirement fund with another world tour. On Tuesday, Hallelujah’s time would be late in the second set if Cohen and company were keeping to the tour setlist. Still, a Hallelujah chorus sometime before midnight — well, who wouldn’t want that? Excellent show. The standards were rock solid, the ones from the vault inspired, but for me the highlights were the new Old Songs. The band now having lived with them for a while, there was an expansiveness to them beyond the album recordings, which made it clear as air that they are worthy members of the canon. Many thanks to Leonard, the band, the crew, and the crowd. Very enjoyable evening, if I'm now paying for being out that late on a school night. Thanks to for your feed-backs, all of you, that were there! They are the most interesting to read. This is a promo video for the London show - that was uploaded to YouTube by "BudweiserGardens" - possibly provided to them by the CBC - or Sony ? This is your typical cavernous arena/stadium which normally is used for hockey and basketball. Talking to the locals, I was told that it hosts many well known names that choose to appear here in lieu of larger Canadian cities because of the acoustics. One of the security told me that for the LC concert the capacity was 5500-6000 because the area behind the stage was not being utilized. In my thinking, those 'behind the stage seats' were now on the floor and it sure looked like more than 6000 people - but what do I know. All ages, but majority, around 60-70% were 'mature'. Again in talking to locals (small retail business owners, restaurant staff, hotel staff) the general impression is that the majority of this community is comprised of 'old money' and students, both of which do not or cannot easily part with their money. So, in light of the fact that the night before the concert, I was still able to pull up second row floor seats on the side, it was nice to see that it looked like a sellout. This was a very reserved, 'polite' audience (one of the locals called them 'sticks in the mud'). As a result, the standing ovations were sparse; upon the band and LC's entrance, after Anthem, after Hallelujah, after Take this Waltz, at the end of the first encore set, and at the end of the show. Also, the applause after songs was short-lived. The result of this, and again, I have never experienced this, was some 'dead air' between applauses and the starts on the next songs. There was also, NO singing along on anything, and very little (from what I could see) taking of photos or videos. A big plus - no walking around during the concert. In addition to the above, during an encore, the technicians were bought onstage and introduced (I have never seen this done before). LC also did take the time to acknowledge, by name the rest of the crew - lighting, sound, monitors. BOTW - she cried to me, "Hey, why not ask for a little bit more?" Upon entrance everyone on stage was wearing a Unified Heart ring on the middle finger of their left hand. After 'Who By Fire', all the rings disappeared. Perhaps this is because the next song was 'Darkness' from the newest album and this is the 'Old Ideas' Tour. He was the most chatty I've ever seen. He thanked everyone for the warm welcome,"Even though it's a mild winter, it's nice to be inside.". Never look into a magnifying mirror was expanded to 'if you're over 15'. I could have sworn there was a 'teen' after 'fif' and not a 'ty' to make it fifty. And then it continued, but I don't remember (Here I plead 'old age'.). Because in the last 14 or so shows, since Seattle, the first set has not changed (with the exception of the first Toronto show, where they got Different Sides - lucky them), in this first set in London, they were like a well-oil machine - PERFECTION! Then again, I could find no fault with the rest of the show either. They were at ease and enjoying themselves. They know how to do a concert right. Now I wish I could get my computer to scan the official setlist. This has got to be one of the most interesting ones I've seen. Once I get the scanning down, I will post it. Last edited by MaryB on Thu Dec 13, 2012 8:19 pm, edited 1 time in total. MaryB wrote: Before he started 'Anyhow' he expanded on he wants to keep touring so he can start smoking when he's eighty....he doesn't want to do it alone, he wants to do it with his buddies. And then he went on, to the best of my memory, how he would be in a wheelchair, attended by a nurse, preferably female, she would bring him a fresh pack of cigarettes, he would ignore the warning label, which by that time will probably be flourescent and in 3D and he'd still ignore it. LOL. Got to love Leonard's sense of humor.